Does Food Addiction exist or is it just an excuse for overeating? Are you a chocoholic, or a self-confessed sugar addict? You're not alone in believing that certain foods have a hold on you and your love for chocolate bars or sweets is out of your control. 'Food addiction' has become a popular phrase bandied about in the media of late. However rather than it meaning someone's love for a favourite food, it seems to have taken on a heavier meaning, being compared to drug or alcohol addiction. So can food really be addictive or is it all in the mind? Food is used as a reward from a very early age - babies cry and get fed, children tidy their toys and are given sweets, teenagers study hard and treat themselves to chips on the way home etc. And as adults we 'reward' ourselves for getting through the week with a large glass of Chardonnay on a Friday night! Our brain contains reward centres which are stimulated when they receive the right amount of 'food' to function properly. What is surprising is that the only food the brain can use is sugar. In our bodies we break down all carbohydrates into its simplest form - glucose. Glucose (which is a form of sugar) is the only food that the brain can use - it needs 6 grams of glucose every hour to function normally. If there is no glucose available, the body can adapt to use some protein and fat molecules but these aren't long term healthy options - we have evolved to need a readily available supply of sugar for our brains. Scientists have studied the reward centres of the brain and shown that food evokes positive responses - not really a surprise! Show a hungry person a picture of a chocolate bar and they get a bit excited! What was interesting though is that there seems to be a preference for 'sweet' things in these brain reward centres - a picture of broccoli, for example, doesn't produce this same excitement. But this is probably all due to the fact the brain recognises it needs the sweet foods to survive - the brain needs that 'glucose boost' to keep functioning normally. So we do have a preference for sweet food but does this actually mean we're addicted? Scientists now believe that food addiction, in the true sense, isn't a real experience - in the same way drug or alcohol addiction is classified, and the worry is that people can use their 'food addiction' as an excuse to overeat. In the fight against obesity, the area of compulsive eating and food addiction is being thoroughly investigated. Food addiction is a well-studied area but most of the evidence is based on work done on rats due to the complexity of the human body. Sensational headlines such as 'Sugar is more addictive than cocaine' have come out of some of the studies done on rats but does this mean humans can become addicted to food in the same way as drugs? The answer seems to be no. Rats did show a preference for a sweet drink over cocaine but these rats were already addicted to cocaine, so almost immune to its effects. The sweet drink gave them an energy boost, and provided that 'reward' they were seeking. So this isn't addiction to sugar, but purely a normal physiological response to needing glucose for the brain. What about cravings? 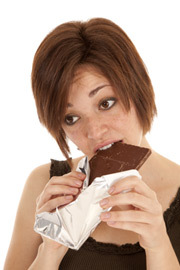 In fact, cravings aren't addictions but merely our body's normal expression of appetite control. Craving arises because we try and resist our desire for the food. Isn't it true that the more you deny yourself something, the more you want it? A recent YouGov poll commissioned by Nutracheck found that people were more likely to successfully lose weight if they carried on having the foods they enjoyed, such as chocolate, as part of a calorie controlled diet. Giving up food can actually be counter-productive, with one study showing as many as 65% of people who gave up treats completely, ended up gaining weight. So when it comes to food, we all know which things press our buttons, but that doesn't mean you are actually addicted to the food. We are bombarded with sensationalist headlines about food addiction but it's so important to look behind the headlines and make informed judgements about the quality of the science. Has the study been done on rats or humans? How many people took part, for example? Until someone finds a magic cure to help us to switch off our preferences for high calorie foods, the only realistic solution is to aim for a healthy balanced diet most of the time, including some of the treats you enjoy, and to be as active as possible. We advocate being careful about your food choices 80% of the time, then you can afford a few treats 20% of the time! By keeping food intake in check through sensible choices, portion control and moderation, there's no reason why reaching your weight loss goals shouldn't be a reality.